On the rocky island called Geyser Rock, in the immediate vicinity of Dyer Island, lives a seal colony of approximately 60,000 animals. 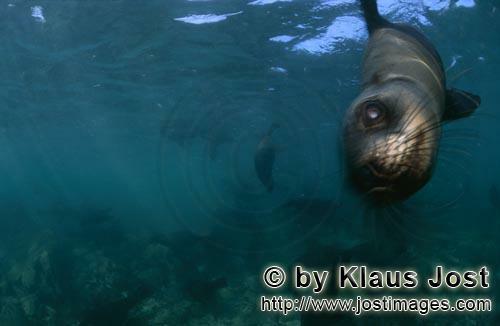 As long as the South African Fur Seals (Arctocephalus pusillus) stay ashore and in the shallow water in the immediate vicinity of the island there is no danger for them. But if they start for their fishing hauls on the open sea – they dive 40 to 50 metres deep and are able to stay under water for up to five minutes – while swimming out and at their return, they have to cross a dangerous area which is tough for them. White Sharks lurk here. Seals are especially valuable for them. The danger is not over until the seals are back ashore. The high concentration of Great White Sharks is due to the seal colony.